Explore hidden gems such as Immigration Museum and Melbourne Central. For shopping fun, head to Collins St/Swanston St or SpellBox. 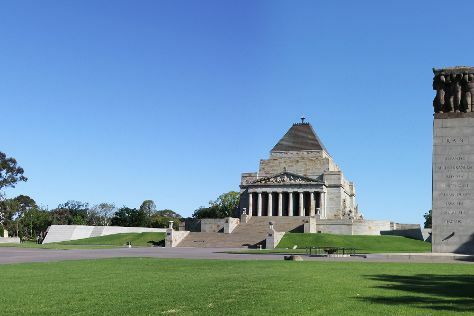 And it doesn't end there: admire the landmark architecture of Shrine of Remembrance, enjoy unforgettable views with a balloon tour, admire the masterpieces at National Gallery of Victoria, and examine the collection at Melbourne Museum. For ratings, where to stay, traveler tips, and tourist information, read our Melbourne trip itinerary planner . Newark, USA to Melbourne is an approximately 27-hour flight. Traveling from Newark to Melbourne, you'll lose 15 hours due to the time zone difference. Traveling from Newark in April, expect a bit warmer with lows of 50°F in Melbourne. Finish your sightseeing early on the 6th (Sat) to allow enough time to travel to Penrith. Penrith is a suburb and major centre in the metropolitan area of Sydney, New South Wales, Australia. Start off your visit on the 7th (Sun): explore the galleries of Campbelltown Arts Centre, buy something for everyone on your list at Macarthur Square, then have some family-friendly fun at Ultimate Karting Sydney, and finally examine the collection at Penrith Museum of Printing. Keep things going the next day: indulge your thirst for a good beer at Go-Shu Australian Sake Brewery, take in the exciting artwork at Penrith Regional Gallery, then have some family-friendly fun at iFLY Downunder, and finally look for gifts at Duck In. To find reviews, photos, other places to visit, and tourist information, refer to the Penrith travel route planner. The Route module can help you plan travel from Melbourne to Penrith. Traveling from Melbourne in April, expect nights in Penrith to be about the same, around 54°F, while days are a bit warmer, around 75°F. Cap off your sightseeing on the 8th (Mon) early enough to travel to Manly. Head to Aboriginal Fine Art and Craft and Mosman Art Galleryfor plenty of shopping. Explore hidden gems such as Shelly Beach and Palm Beach. Change things up with these side-trips from Manly: Barrenjoey Lighthouse (in Palm Beach), Whale Beach (in Whale Beach) and Bilgola Beach (in Bilgola). There's lots more to do: look for all kinds of wild species at North Head Sanctuary, view the masterpieces at Joel Coleman Gallery, kick back and relax at North Narrabeen Beach, and stroll through Warriewood Beach. To find maps, other places to visit, and other tourist information, use the Manly journey planner . Getting from Penrith to Manly by car takes about 1.5 hours. April in Manly sees daily highs of 73°F and lows of 59°F at night. Wrap up your sightseeing on the 13th (Sat) to allow time to travel back home.